On to Dredd chasing PJ Maybe in the story Monsterus Mashinashuns. What was interesting was a thread was established here that will go in to have a large story arc of its own later down the line. Ah the benefit of hindsight (and of reading a few modern stories). Rather than spoil this story it has added a great deal of intrigue to see how it plays out. Like an Origins story, I guess. Looking forward to more Wagner and Ezquerra goodness next time. I got into Zancudo a bit more this week. Our two Judges enter the den of the giant Mosquitos that have been plaguing them, where strange goings on are occurring... I think I mentioned last time that this was a bit of a weird one, and I'm ok with it. Dreddlines had a letter praising the strip and a letter deriding it but I think you know my style is to not rush to judgements on these things, and I'm happy to read this strip and am intrigued to see where we head. I think Devlin Waugh's latest adventure, All Hell, made a bit more sense this time around. I was a bit lost at the end of episode 1, but there was a decent explanation narrative in the first part of this episode, so I am back on track. A bit. I think. John Smith isn't the easiest writer to follow sometimes, but his story telling usually brings it's own rewards. I am persevering. And Colin's art is definitive for Devlin Waugh. Johnny Woo. A Bullet In the Head. Boy do I like this! More car chases, gun fights, martial arts and old scores to settle. Rennie is on super form here. It's not all wham, bam either, there is a decent story building here. Can't wait for the next episode of this. I just hope the high quality is maintained. The pace felt like it had accelerated in The Bogie Man this time round. I am still tapping my foot impatiently waiting for it to finish, but it does rather feel we are starting to get somewhere. At last. There is a fun chase through the streets with the gang after the rescued immigrants. Hoping we wrap up next time. Anderson did some standing around and a bit of thinking in this instalment of City of Dead. We did watch the mysterious malady take form in some poor citizens and in some robot dogs at a dog show. Anderson has some theories, but she is allowing herself to be fobbed off a lot. Again. Perhaps this is the older Anderson, but I can't help thinking 25 years ago she would have gone in and kicked a few arses. I must apologise for not mentioning the British Icons text article series which has been running in the last few issues. Basically, a writer reviews a British fictional character of old. BARNEY has all the details for previous issues, but the reason I haven't mentioned them is I haven't been reading them. I generally don't know them, so I don't bother with them. This time it was Sexton Blake who, again, I hadn't heard of. I read the article in places, but I think you need to be a fan to get something out of it. 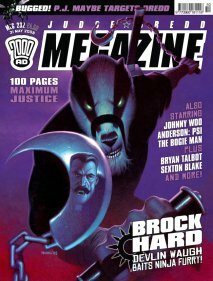 Bryan Talbot was under Interrogation in this issue, and I don't know why, but it didn't hold my interest. Perhaps it's because I'm not familiar with much of his work? In Heatseekers, I read all the columns (it was a long train journey!). The history of Snuff was interesting in the Movies section as I genuinely thought actual people were hurt in the making of that film. It was a hoax. 2048 sounds a bit bonkers, but then a lot of stuff in the Orient section does! Cult TV examined a fairly poo Doctor Who and the Comics section was ok.
And finally... Metro Dredd wasn't bad at all this week. Would really have worked as 5 daily strips I think. Good work Bishop and Clarke.